The Arizona Cardinals fired offensive coordinator Mike McCoy last week after a team-wide display of ineptitude last Thursday night against the Denver Broncos (the team that fired McCoy less than one year ago from the same position. Our biggest takeaway from the McCoy termination isn’t really about McCoy, or that specific firing at all. Nor is it anything specific to the Cardinals coaching staff. We anticipated that Arizona was going to be in for a long season. Rather, the biggest takeaway is the problem of identifying coaching talent. Head coaches have a significant — but frequently unarticulated — responsibility to identify and develop coaching talent. It’s harder to do than fans and even coaches think. Most head coaches think they know how to assemble a staff but very few actually do. That is never more evident than when a head coach is compelled to make a move during or immediately after year one on the job. ∗ McCoy was fired in late November last year during Vance Joseph’s first year as Denver Broncos head coach. ∗ Bills head coach Sean McDermott fired offensive coordinator Rick Dennison after a playoff appearance last season, McDermott’s first as head coach. ∗ Jets head coach Todd Bowles is on his third coordinator in four years. ∗ In college, LSU head coach Ed Orgeron parted ways with offensive coordinator Matt Canada after one year. Here’s the problem: By firing a coordinator so early in a head coach’s tenure, the head coach acknowledges there’s an issue with the “program” they are attempting to implement. A head coach is still trying to sell the players, other coaches and administrators that he has the answers. Yet, this is an admission that something didn’t work. This was not part of the process. This termination may set back the development of the team a bit, as roster moves and recruiting decisions may have been made to reflect what the fired coach wanted for his system. 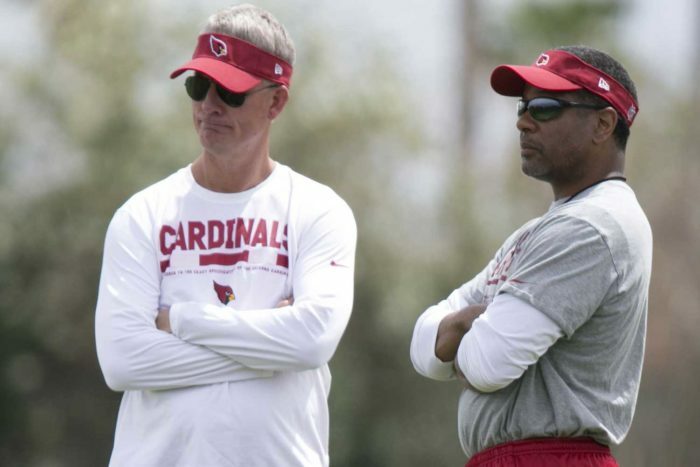 We are not halfway through the season and there are already rumblings that Steve Wilks may not be in Arizona next year. Firing Wilks may be too rash, but at this rate, if nothing improves, he’s certainly coaching for his job next year. This is why hiring that first staff is so important. Head coaches get fired because they can’t get a good staff together. A head coach must consider a number of factors when putting together a staff. He must find coaches that are competent, dependable, hardworking, and have good rapport with players and the other coaches. Other considerations include bringing in people that won’t embarrass the team on or off the field. This creates a very narrow pool of coaching candidates. In McCoy’s case, he was coveted because of his prior offensive coordinator experience as well as previous head coach experience, both qualities that Wilks was looking for in an offensive coordinator. Of course, if Wilks was specifically looking for an offensive coordinator that was previously a head coach AND is looking for a job, well, that’s a very narrow group of candidates. New head coaches sometimes can’t always get the candidates they want. There are considerations, such as whether the coach they want is currently under contract with another team or has permission to interview and if the team is creating or attempting to create a successful culture that will attract talent. A head coach should consider the potential motives of people that are recommending coaches. For example, a head coach must be careful that he is not absorbing an assistant coach that another head coach is trying to remove from his staff without firing him. This is a frequent occurrence in the NFL. It’s an underhanded move, but it’s one that you can see if you pay careful attention. The decision to terminate a coordinator may appease an angry fan base and weary front office. It’s a decisive move that may work out in the organization’s favor. But it’s a red flag that something was amiss from the very beginning of the head coach’s tenure and that he’s likely to be the next headed out of town. When putting together a staff, the head coach must get it right the first time.